Recently, I auditioned for a nationally televised cooking show. (I'm under contract to keep my trap shut as to the name of said show.) For the audition, each of us had to bring a dish that exemplified our cooking skill. I brought a charcuterie plate. "Charcuterie" comes from the French word for pork butcher. A charcuterie plate is a dish of selected meat items with accompaniments. It demonstrates the chef's skill in preparing meat. What better dish to bring to this audition? Going clockwise from the top left, the items in my charcuterie plate were Chicken Liver Pate Mousse with Onion Marmalade, Creole Mustard in Citrus Bowl, Pink Pickled Egg with Pink Peppercorns and 18 - Month Aged Cheese, Cactus Pickles, Baguette. 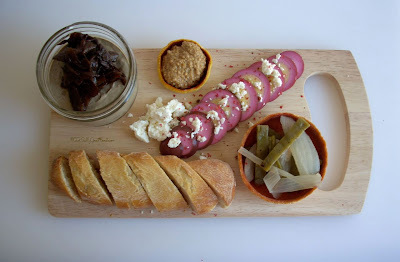 I made everything in the photo except the glass jar and cutting board. At the audition, the chef who tasted my dish loved it! They gave me a callback! However, they never called again. Almost, but not quite. *Sigh* Their loss is your gain, my friends. I'll be posting recipes for your culinary enjoyment. Nyah. So there, Ms. Casting Director. Maybe I should have made the cutting board, after all. Drat.